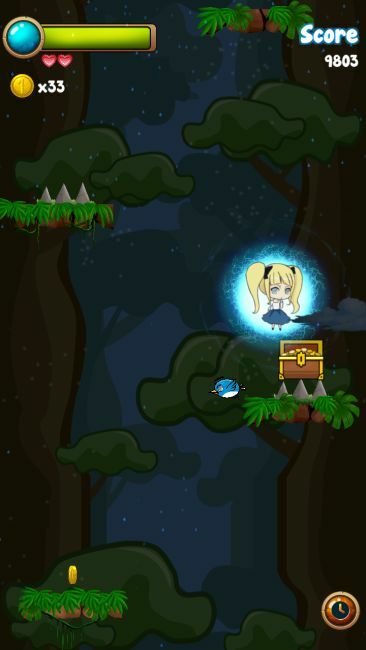 Alice Fall is the perfect inversion of Doodle Jump and better in every aspect. You all know Alice in Wonderland, but I guess this is more like Alice in Nightmareland. Stuck on a floating island, our character has only one way to escape: Downwards. 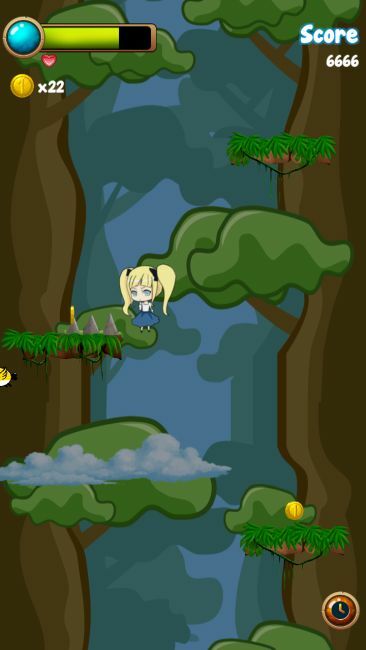 Whereas the sky hasn’t fallen in on her yet, it’s coming precariously close, while she’s jumping from platform to platform, trying to dodge angry birds and dangerous spikes. Wake up, little Alice! “Where Doodle Jump is a game that challenges you to jump up, this is a game that challenges you to jump down.” – Couldn’t have said it better than the Google play description, because this is exactly what you do. Unlike Doodle Jump, however, you don’t steer a freaking vuvuzela, but a cute, little, pigtailed girl. And the way down is perfectly designed as the forest is getting more and more dangerous, dark and mysterious with every mile you’re falling down. Pinocchia – the Wooden Girl. Given that everything (the background, the items, the enemies, the character) looks great in this game, the poor animations appear even more disturbing. With every movement, Alice looks somehow clumsy or wooden, at least unnatural in every way. She’s not falling down, she’s walking down. And when spikes bore through her feet, she doesn’t show a slightest (e)motion. No flinching, no screaming. This character has such a huge potential to induce emotions, but she appears too lifeless. E… E… E… Electric Shock! Alice Fall is a great game thanks to beautiful graphics, a sweet main character, and an original game idea. Once Venture Ark Studio breathes a little bit more life into Alice, I’d have nothing to criticize. Download the game here.